Justin lives in Georgia now but the first time he came up to fish the Ottawa was a few years back with his great friends Rich and Henry when he lived in Jersey. After a bunch of trips the boys have seen it all. From 3 day trips with 25 big fish up to the boat and not much to show for it to 30+ pound rodeo fish at the side of the boat in the dark. They cut their teeth on here you might say and I am proud to say that they are now all well schooled hard working musky machines. To say that Justin has paid his dues is an understatement. He has had to live with Henry giving him constant pointers on how not to blow fish at the side of the boat over and over and over for a number of years now. 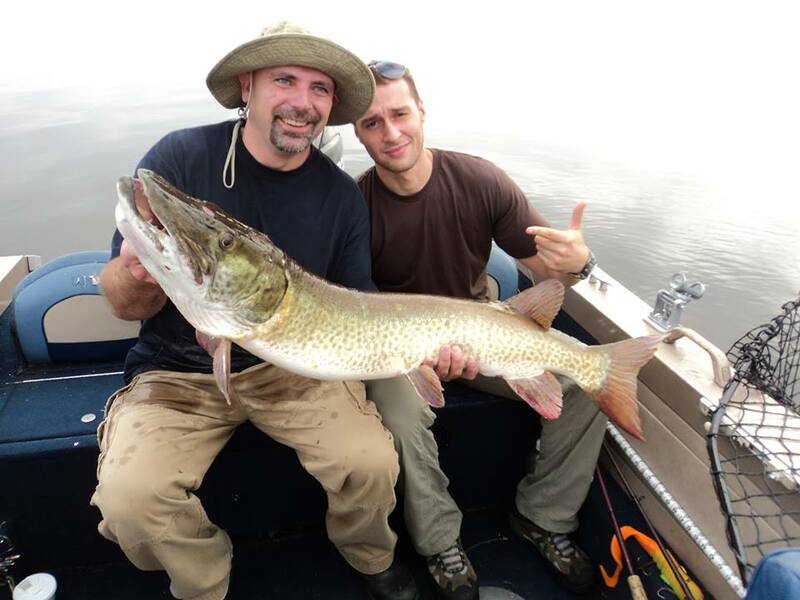 Rich used to catch almost all the ‪#‎muskies‬ here and Henry finally broke through last year with an epic fish of a life time that ate his hand, literally. Pic 2 shows the Fish that ate Henry from last year. This was a ‘Rodeo Fish’. For those who don’t know that term in the musky world it means a fish that is in the net in less than 8 seconds. Only Spencer Berman is faster with a net! Pic 3 – now there is a sad picture. This is from two years ago when Justin was last here. He bet me $5 early on in his trip that he wasn’t going to catch a musky. The bet was an obvious no brainer and I was looking forward to posting Justin’s fiver on the wall. Oops, promising to catch a musky is often a sure way to learn humility. Bad PMA is also a way to ensure that you probably won’t catch one too. When you have a big positive musky attitude, good things happen because you fish harder and you pay closer attention to the details that end up making the difference when it is tough. Pic 4 – I never liked pic 3 until pic 4 was born last week. Justin showed up as a surprise guest to fish with his good friends again. He was once again sure that he wasn’t going to catch a musky and this time he wanted to up the anti to $10. The sucker was willing to go Canadian money against US and so obviously I took the bet again. Pic 4 shows our boy in all his glory. Finally during 30 km north winds and a massive cold front it happened. Check out the smile on this boy!! Pic 5 – The conclusion to pic 4 and the shot that now makes pic 3 become something very special in musky factory lore. ‘It was the best ten dollars I ever spent ‘said our boy. Justin’s on the board baby, look out musky world! 1) Polish Vodka is so smooth you will drink more than you intend to and your head will hurt the next day. 2) Polish people will sit with you for hours and talk about muskies as long as there is Polish Vodka on the table. 3) Kubasa with Polish mustard on Polish rye bread is amazing and you will eat more than you intend too and your stomach will hurt the next day. 5) Even though you know all of the above it will happen on consecutive nights as long as your Polish guests are around. 6) They don’t seem to learn either. I wish you tight lines as the fall ‪#‎musky‬ season is upon us!